Located on the north side of FM 306 just east of the easternmost bridge crossing of the Guadalupe River. See map. Provides 500 feet of bank access upstream of the 306 bridge crossing along the east side of the river. The bank is rocky and lined with cypress trees. A deep pool is located just above the bridge. Anglers can wade fish both upstream and downstream. 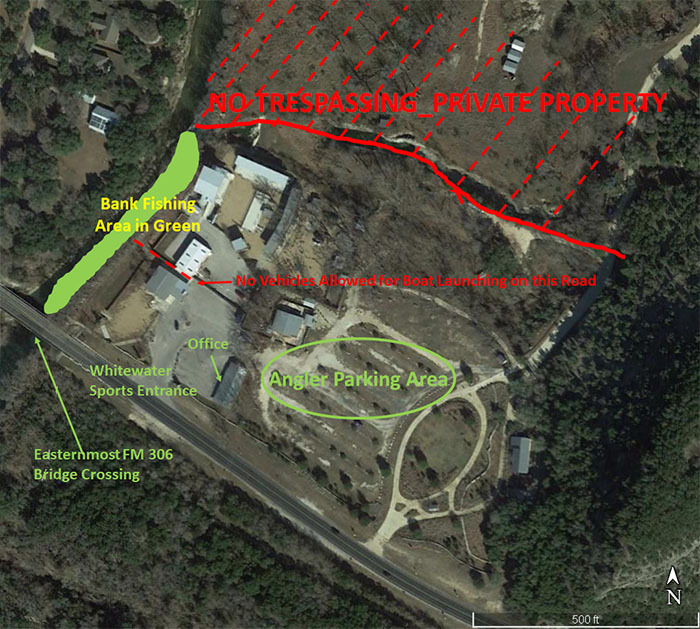 The next downstream take out for float trips is the TPWD lease access site at Rio Guadalupe Resort (lat 29.843805, long -98.169170) located approximately 1.6 miles downstream at the fourth bridge crossing on River Road. Anglers with vehicles and/or trailers are required to park in the lot behind the office and portage boats to the river. No vehicles allowed in the area between tube building and warehouse. Leased access is open from 30 minutes before sunrise to 30 minutes after sunset each day for fishing from the banks and launching non-motorized boats, canoes, kayaks, or other floatable devices for the purpose of fishing. All other uses will result in a daily access fee being charged. Rainbow and brown trout, Guadalupe bass, smallmouth bass. This site is stocked by TPWD with rainbow trout from December – February. Check the trout schedule for specific stocking dates. Special trout regulations are in effect on this stretch of river. For limits on other game species, visit our Guadalupe River regulations summary.